1. It is a pleasure for me to meet you. I thank you for your warmth and affection, and your very special welcome. To have received them in such a faraway land is truly special and I deeply appreciate the gesture. 2. I just saw a colourful panorama of your life in Chile. You have travelled to a country that is so far away from India and established new and meaningful lives for yourselves. For us in India, all of you are our envoys, promoting India´s image and culture through your daily interaction with the people of this country, which you have chosen as your new home. 3. 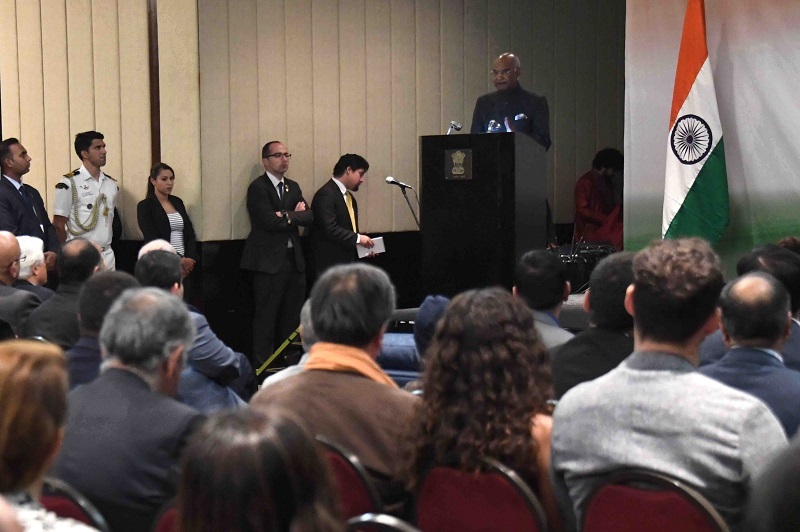 Here in Chile, I am told that the Indian community has integrated well into the Chilean society and has established a good reputation for itself and for India. I congratulate you, therefore, on being successful envoys for India and for imbibing the spirit of "Vasudhaiva Kutumbakam” – that is- the world is one family- to the core. 4. We tremendously value your involvement in initiatives organized by our Government through our Embassies. Such interaction defines the partnership between all of you and all of us back home, a partnership that not only is of mutual benefit, but is also a crucial building block on our route to the future. There are many people in this gathering who have achieved success and recognition, and who have rendered assistance to the Indian Embassy.Unfortunately, I do not have the time here to acknowledge everybody by name. But specifically, in the context of the 150th birth anniversary of Mahatma Gandhi, that we are celebrating this year, I would like to thank Cecilia Frigeiro, Joakin Bello and Juan Elgadofor their vocal and instrumental contribution to the singing of Mahatma Gandhi’s favourite bhajan "Vaishnav Jana To Tene Kahiye”. I would also like to thank Mr. Louis Bates, eminent lawyer and former Law Minister for instituting in San Sebastian University, the Gandhi Prize for outstanding contribution in the field of community law. I also recognize the esteemed presence here of Madam Angela Jeria. 5. I know that some of you in the audience are not Indians by either birth or descent, but you are here because you are friends of India and relate to the spirit of India. I thank you for your presence today, for your partnership and for projecting our shared values. You represent the route to help us achieve a better understanding of Chile and Chileans. And through your affinity and interest in India, you will be able to help us project India in Chile. 6. My State Visit is historic for many reasons. For one, I am the third President of India to visit Chile. For another, 2019 marks many significant anniversaries - 70th anniversary of the India-Chile Diplomatic Relations, 70th anniversary of the Indian Constitution, 150th Birth Anniversary of Mahatma Gandhi and 550th Birth Anniversary of Guru Nanak Dev ji, the Founder of Sikhism. I will be paying my respects to our Father of the Nation at his statue in the city later this evening. And tomorrow, I would be speaking on his legacy and what his life holds for the youth in this country at the University of Chile. This year, on 13th April, we will also be observing in India the 100th anniversary of the Jallianwala Bagh tragedy, to remember the sacrifice and valour of our martyrs. 7. The common thread which ties all of these anniversaries together is the thread of humanity. As the world around us is increasingly falling prey to negative forces of terrorism, of violence, of greed and intolerance, the universal messages of peace and tolerance preached by Guru Nanak Dev ji and Mahatma Gandhi are increasingly relevant. Also relevant are the examples of constitutional democracies based on the rule of law, equality and fundamental freedoms, represented by both India and Chile. 8. The values that shape both our republics are the values that uphold the supremacy of the people. Nowhere can this be seen in all its beauty as in the democratic exercise of the power of the people through elections. Chile went through its election process at the end of 2017. India will shortly be undergoing the General Elections which will lead to the formation of the 17th Lok Sabha. Over 900 million electorates will cast their vote in what would be the largest democratic exercise on our planet! 9. In 2022, we will celebrate the 75th anniversary of our independence. We are marching on a transformative journey towards a prosperous 21st century new India. The Government of India has implemented various initiatives such as the Make in India, Digital India, Smart Cities, Goods and Services Tax, Clean Ganga Mission, Swachh Bharat, Jan Dhan Yojana, Ayushman Bharat, Ujjwala Yojana for unleashing transformative economic growth and social change, and for ensuring that the fruits of progress reach out to all corners of the country and all sections of the society. 10. We have made significant strides in science and technology. With successful Mangalyan Mission and launching a record number of 104 satellites in a single mission, we have achieved major feats in space exploration. We are now progressing towards Mission Gaganyaan, the Indian Human Spaceflight. 12. I am told that in Chile, India is loved for its music, for its dances, for its arts, for its ancient disciplines of Yoga and Ayurveda, all of which are very popular here. Earlier, we have enjoyed Indian and Chilean artists coming together to present some iconic compositions. I thank the artists for setting a shining example of the kind of collaboration that forms the bedrock of our friendship. 13. Tomorrow, I will be meeting President Sebastian Piñera and we hope to have fruitful and productive discussions which will move our bilateral relationship forward in a constructive and mutually beneficial way. In the preliminary discussion, we have already identified focus areas of mutual interest ranging from outer space to health. We are also keen to strengthen our business engagement – from IT, solar energy to mining and beyond. I will also be addressing the India-Chile Business Forum tomorrow. Your cooperation will be invaluable in the realization of our agenda, with which we hope to take our relationship to a higher plane. 14. Let me once again thank you for joining us this afternoon and wish every one of you a successful and prosperous future. May this historic year be the beginning of many more historic years to come where all of us will grow and thrive together in harmony with the world around us.एक और अनुरोध मैं आपसे करता हूँ कि आप अपने घर पर अपने परिवार से अपनी भाषा में बात करें चाहे वह हिन्दी हो, सिन्धी हो या तेलगुया तमिल हो जो कि आपको अपनी जगह व सभ्यता से जोड़े रख सके।आप सभी से विदा लेने से पहले, मैं आप सभी को राष्ट्रपति भवन को देखने के लिए आमन्त्रित करता हूँ।हाँ, यह मेरे लिए कार्यालय सह आवास है परन्तु यह ऐतिहासिक भवन आप सभी भारतीयों एवं अन्यपर्यटकों के लिए सदैव खुला है इसलिए हमारीविरासत व लोकतान्त्रिक मूल्यों को जानने के लिए आप सभी का राष्ट्रपति भवन में स्वागत है।And as I say good bye, I wish to invite each one of you to visit Rashtrapati Bhavan. Yes, it is my residence and office but it belongs to all of you and the tourists first and foremost and you must come by to learn of its democratic values and heritage.